This book talks about scripture, devotional. 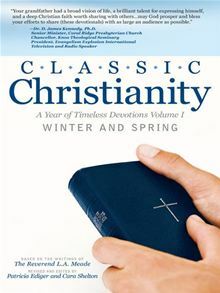 Classic Christianity contains daily devotionals which broach topics throughout Scripture with an evangelist’s heart, a scholar’s insight, and a grandfather’s tender touch. The ideas and topics covered are not only relevant to life in today’s world, but are startlingly current – pointing to the timelessness of a life based on Scripture. Each day’s devotion begins with Scripture, and ends with prayer, bookending the Reverend Meade’s reflections on everyday life through the lens of eternal purpose.